French Dance company Le principe d’incertitude, led by Liz Santoro and Pierre Godard, and Singapore’s T.H.E. Second Company present a five-hour performance that unfolds across the National Gallery Singapore’s public spaces. The performance will start at the Padang Atrium. Learning is part of the National Gallery’s special programme Performing Spaces, which conceives of space as a living organism that creates encounters between performers and the public.Sharing through a performative form this moment of intimacy and high focus, the dancers are scattered throughout the galleries, before gathering, thus blurring the boundaries between process and representation. This complex learning process originated from their 2016 performance piece For Claude Shannon, first performed in a black box. Santoro and Godard took the grammatical structure of a sentence from the book A Mathematical Theory of Communication by computer science pioneer Claude Shannon as starting point. They derived a logic from the sentence’s structure that determined how different movements can combine to generate an inexhaustible choreographic phrase. Each time Learning is performed, the dancers assemble a new choreographic score, randomly generated from twenty-four “atoms” of arm and leg movements. Another version of Learning has been performed at Centre Pompidou in Paris in March 2018. When a choreographic work designed for a black box theatre is transposed to a white cube gallery space, the body’s relationship to space needs to be reconsidered. Questions on how the environment informs the dance language, and in turn the audience’s behavior and experiences come into play. 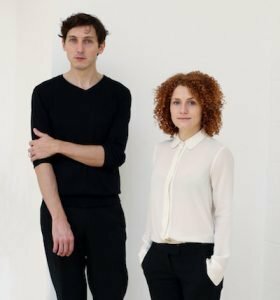 Join the co-founders of Paris-based Le principe d’incertitude (LPDi), Liz Santoro and Pierre Godard, as they share about their experience of reconfiguring a dance work for the National Gallery Singapore. Made possible by the Ministry of Culture, Community and Youth, and the Tote Board Group which comprises the Tote Board, Singapore Pools and Singapore Turf Club. Le principe d’incertitude (LPDi) was co-founded by Liz Santoro and Pierre Godard in 2011. He now devotes himself to discovering new performative forms involving movement and text, and also researches Artificial Intelligence at LIMSI-CNRS to support the documentation of unwritten and endangered languages. Liz Santoro is an american choreographer and dancer. She studied both in Boston Ballet School and Harvard University, Cambridge where she majored in neuroscience. After graduating, she pursued her dance education in New-York, where she trained different technics from classical dance to improvisation and Body-Mind Centering within the Movement Research. She then performed with Ann Liv Young on numerous shows in New-York and across Europe. She worked with many renowned choreographers such as Alexandra Bachzetsis, Jack Ferver, Philipp Gehmacher, Trajal Harrell, Sam Kim, Heather Kravas, Jillian Peña, Eszter Salamon & Christine de Smedt, and David Wampach. Engineer by training, Pierre Godard shifted his career path from finance to theatre, where he worked as a technician, prop man, lighting director and scenographer alongside Jean-Michel Rabeux, Sylvie Reteuna, Sophie Lagier, and Valère Novarina. After graduating in Natural Language Processing at Sorbonne Nouvelle, he started his thesis at LIMSI-CNRS on alignment probabilistic models notably used in automatic translation.